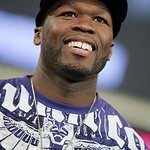 Rapper 50 Cent is the latest star to donate money earned from a performance for Libyan leader Moammar Gadhafi. “In light of the on-going events in Libya, 50 Cent will be making a donation to UNICEF, which is providing vital relief supplies to meet the needs of women and children at risk during this crisis," said a rep for the star. 50 Cent performed at a private event at the 2005 Venice Film Festival linked to the Gadhafi clan, and follows other stars in donating performance earnings to charity, including Nelly Furtado, Usher, Beyoncé and mariah Carey.